This is a comfortable soft cot pillow carefully designed to take the greatest care of our baby´s head. Due to its thermo-regulating qualities your child will sleep soundly without sweating and without excess moisture. The Temprakon-advance down cot pillow is recommended for babies up to 2 years old. The shallow height of the pillow doesn’t interfere at all with the baby’s natural neck and head position, so allowing the baby to sleep soundly and deeply. Less than 1 cm. 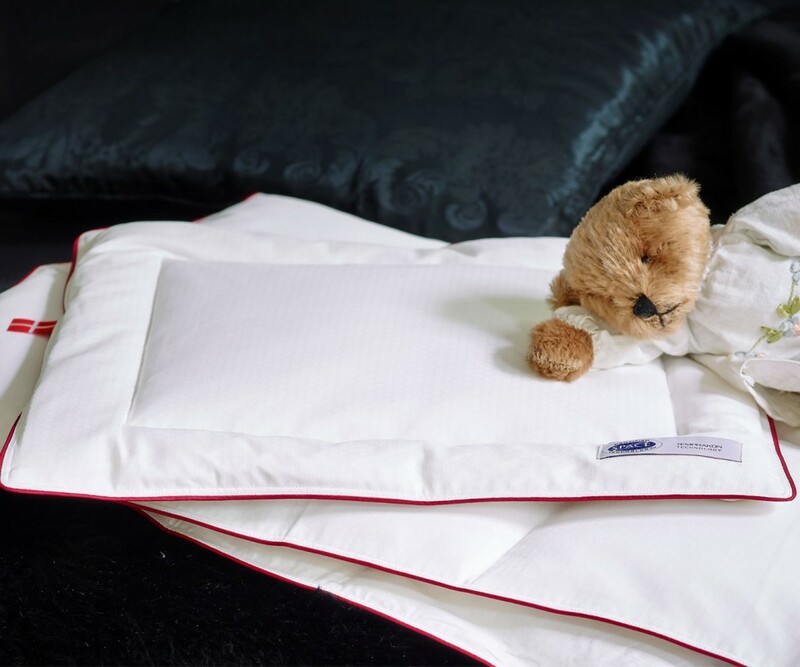 high, the main purpose of this very special cot pillow is to offer extra comfort and protection, ensure the ideal temperature for a good night´s sleep, and at the same time eliminate excess moisture. The Temprakon-advance down cot pillow for babies is completely hypo-allergenic and widely recommended for babies with allergies or sensitive skin. Wash and Care Machine wash up to 60ºC. Tumble dry. Do not bleach. Use a detergent recommended for delicate fabrics. Gentle spin. Do not iron. Duvet Positioning Place the pillow active side (the thermos-regulating surface) facing the head. Identify this side by the label on one the pillow corners. The Temprakon-advance cot pillow for babies has been specially created to offer your baby maximum comfort. Thanks to its dual function of regulating the temperature and eliminating moisture, your baby will rest comfortably and soundly all night without perspiring and at the ideal temperature. 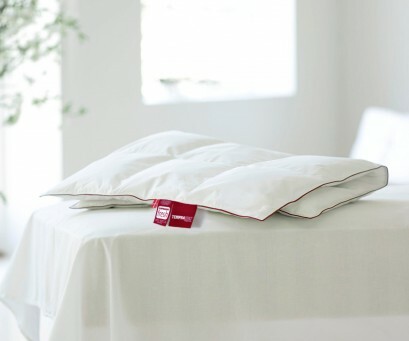 Goodbye to perspiration and excess moisture thanks to the pillow’s thermo-regulating fabric. A special and added secret of this pillow is the thermo-regulating fabric which prevents your baby from sweating as he/she sleeps. She/he will sleep soundly and happily without any of the excess moisture which might otherwise bother her/him. This special fabric is used on the interior lining of the pillow outer cover, is imperceptible to the touch and has the ability to absorb excess heat and store it in the down filling. Only if the baby’s temperature drops is this heat liberated little by little and transmitted back to the baby’s body, so ensuring the baby enjoys an ideal temperature at all times during his sleep. Besides, the Temprakon-Advance cot pillow for babies is capable of eliminating any excess moisture, so guaranteeing your offspring sleeps contentedly, not too hot and not too cold and without sweating. Its unique design makes this pillow the perfect answer for your baby. The cotton cover (100% ‘Super-Cambric’ cotton) is hypo-allergenic and with its soft and gentle touch takes the utmost care of your baby’s skin. The cotton fabric is highly resistant with a special weave which avoids any loss of down from the pillow. Besides, the outside cover of this special cot pillow offers your baby a sensation of natural freshness making her/him completely comfortable. 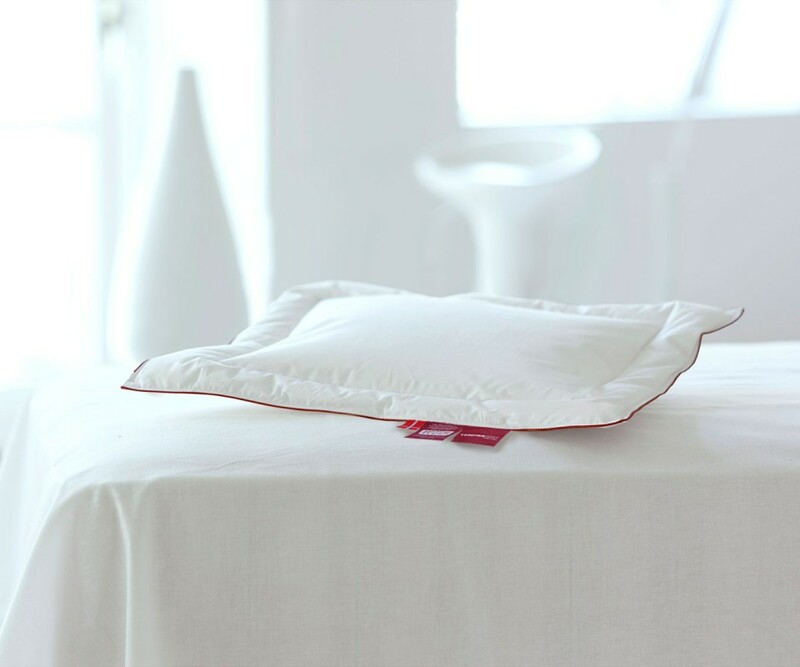 Thanks to a special treatment with natural plant oils this pillow is free of mites and bacteria, staying fresh and natural day after day. Finally, and adding to the complete success of this cot pillow, it is filled with fabulous down of the very best quality on the market; a soft, fluffy and long-lasting filling which makes our cot pillow unbeatable. Why choose the Temprakon-Advance cot pillow for your baby? With the Temprakon-advance cot pillow you make sure that your baby gets and enjoys the rest that he needs. Your baby’s head will be protected, comfortable, neither too hot nor too cold and without any excess perspiration. 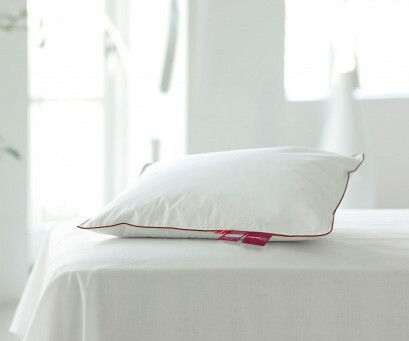 At the same time this pillow meets the highest standards of both quality, hygiene and health. 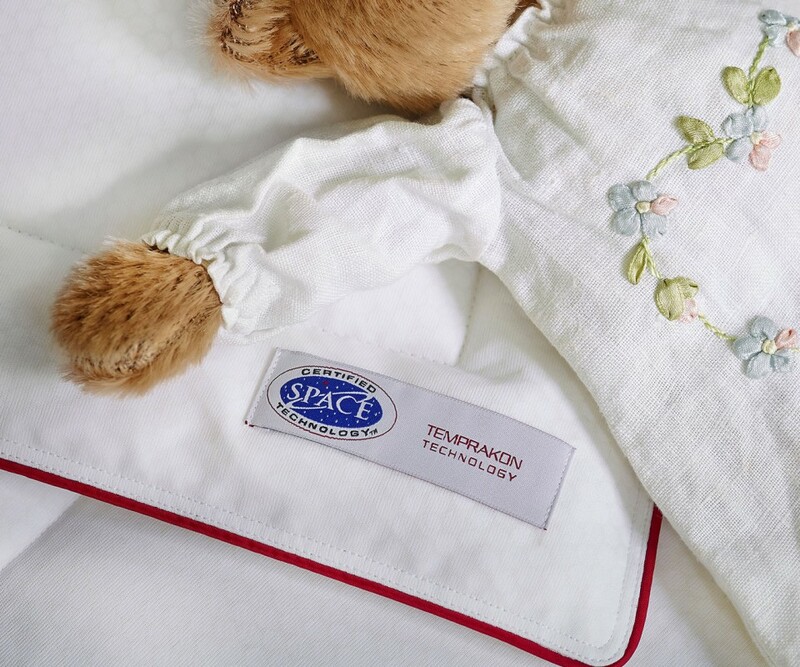 The special treatment of the down and its hypoallergenic cotton cover means that this Temprakon-advance cot pillow for babies can be recommended for babies with allergy problems, dermatitis and even asthma. This Temprakon-Advance cot pillow for babies has been awarded the following certificates of quality: OEKO-TEX, ASTMA &ALLERGI DANMARK, NOMITE, DOWNAFRESH/DAUNASAN, EUROPEAN DOWN AND FEATER ASSOCIATION and CERTIFIED SPACE TECHNOLOGY. All this goes to ensure for you a long-lasting baby pillow with the highest quality down filling, and a pillow which is hypoallergenic, mite-free and with a fabric which is perfect for your baby’s skin. 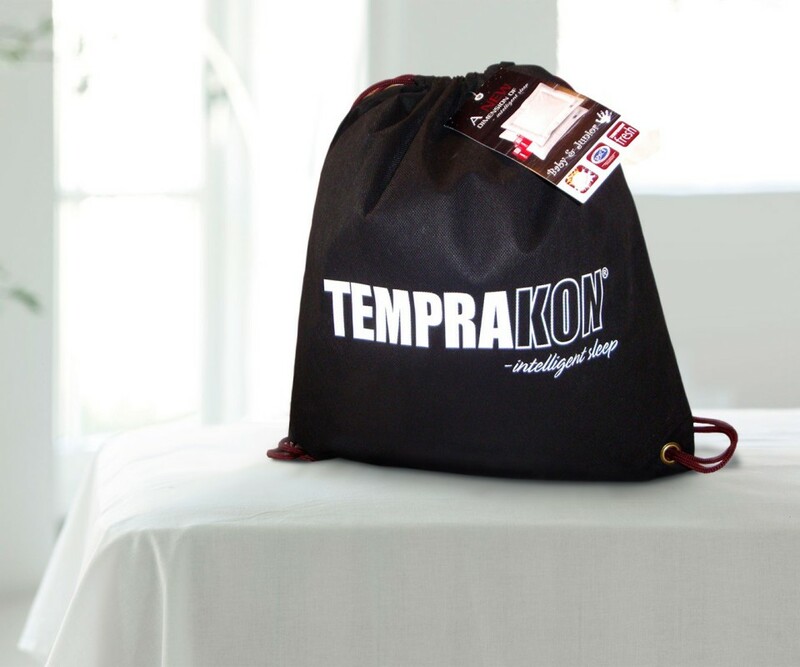 The Temprakon-Advance down cot pillow measures 40X45 cm, and is less than 1 cm. high. This pillow can be machine-washed up to 60 degrees Centigrade. Once washed the pillow should be used completely dry. The Temprakon-Advance baby pillow is recommended for cots, carry cots, prams and pushchairs. Thanks to our policy of prompt delivery and our money-back guarantee we can offer you complete satisfaction; you can purchase from us with trust and confidence. The pillow really works and my little daughter seems to sleep so much better now. She used to get so hot and sticky! After washing it’s as good as new too. Wherever the baby is the pillow’s there too! We shall be buying more from you. At last on the market! And I found it! A pillow for babies! The perfect height ( It’s almost flat ) and the thermal balance you told me about is really great . I am very satisfied! The temperature -regulating fabric really does work. It’s a specially low pillow for babies. She doesn’t seem to get too hot anymore! I gave it to my nephew. My son didn’t want it, so I gave it to my nephew instead. He loves it! Yes, we are all different! You were right. We take the pillow with us everywhere! Thanks for all your help and advice. I’m in love with my pillow! I have a 7-month -old baby and it’s just the right height – and she never seems to get too hot.